AGATE: A variety of chalcedony. Tones and strengthens body and mind. Imparts a sense of strength and courage. Facilitates ability to discern truth and accept circumstances. Grounding, but energetic. Powerful healer. Works with chakras and attitudes according to color of stone. AMAZONITE: A variety of feldspar. Soothes nervous system. Strengthens heart and physical body. Aid alignment of mental and etheric body. Brings joy and uplift-ment. Creative expression. Facilitates clearer vision of one's own harmful tendencies, making them easier to release. Chakra: Throat. light. Stabilizes kundalini awakening. Activates altruistic nature. Spiritualizes the intellect. Chakras: Navel, Solar Plexus, Crown. AMETHYST: A variety of quartz. Strengthens endocrine and immune systems. Enhances right brain activity and pineal and pituitary glands. Power blood cleanser and energizer. Helps mental disorders. Purification and regeneration on all levels of consciousness, Transmutes one's lower nature into the more highly refined aspects of their higher potentials. Physical representative of the Violet Ray of alchemy and transformation. Cuts through illusion. Enhances psychic abilities. Excellent for meditation. Aids channeling abilities. Calming, strong protective qualities. Healing, divine love, inspiration, intuition. Chakras: Third Eye, Crown. APOPHYLLITE: Clear, white, light green striated crystals. Helps one connect to spirit and act in truth. Very powerful for deep, peaceful stillness and alpha state/meditation/dream recall. Clairvoyance, out of body travel. Heals and brings joyous openness to the heart Chakra as it opens the brow and crown chakras. Clears channels for communication with higher-self + angelic realm contact. Helps see truth for growth. Apophyllite is an extremely powerful crystal and will enrich the users' intuitive capacities by stimulating the Third Eye Chakra. AVENTURINE: (Green): A variety of quartz. Purifies mental, emotional, and etheric bodies. Aids in releasing anxiety and fear. Stimulates muscle tissue. Strengthens blood. Emotional tranquility, positive attitudes towards life. Brings one into alignment with their center. Independence. Health, well being. Chakra: Heart. AZURITE: Enhances flow of energy through nervous system (because of copper content). Helps body utilize oxygen. Strengthens blood. Facilitates clear meditation. Cuts through illusion. Enhances psychic abilities. Initiates transformation. Cleanses mental body. Inspiration, creativity, intuition. Chakras: Third Eye, Throat. BLOODSTONE: A variety of chalcedony. Strengthens and oxygenates bloodstream. Enhances physical/mental vitality. Strengthens heart, spleen, bone marrow. Aids in balancing iron deficiencies. Reduces emotional/mental stress. Powerful psychic healer. Stimulates movement of kundalini. Links root chakra with heart. Inner guidance, altruism, idealism. A highly evolved mineral. Chakras: Root, Heart. CALCITE: Aids kidneys, pancreas, spleen. Balances male/female polarities. Alleviates fear, reduces stress. Emotional balancing. Grounds excess energy. Increases capacity for astral projection. Joy, lightness. Works with chakras and attitudes according to color of stone. CARNELIAN: A variety of chalcedony. Very highly evolved mineral healer. Energizes blood. Aids kidneys, lungs, liver, gallbladder, pancreas. Aids tissue regeneration. Vitalizes physical/emotional/mental bodies. Aligns physical and etheric bodies. Enhances attunement with inner self. Facilitates concentration. Opens heat. Warming, social, joyous. Chakras: Navel, Solar Plexus, Heart. CELESTITE: Enhances thyroid functions. Reduces stress. Relaxing peace of mind. Accelerates growth. Aids personal creative expression. Helps one adjust to higher, more rarefied states of awareness. Truth, reliability. Clear speech. Chakra: Throat. Celestite is not as easy to find as it once was and so aqua aura(quartz combined with gold) is often used as a substitute. CHRYSOCOLLA: Aids in preventing ulcers, digestive problems, arthritic conditions. Strengthens lungs and thyroid gland. Enhances metabolism. Excellent for female disorders. Alleviates fears, guilt, tension. Helps clear subconscious imbalances. Activates feminine qualities. Amplifies throat chakra - creative expression, power, communication. joy, emotional balance. Chakras: Heart, Throat. CHRYSOPRASE: A variety of quartz. Balances neurotic patterns. Eases depression and sexual imbalance. Fertility. Calming, balancing, healing for physical/emotional/mental bodies. Helps one see clearly into personal problems. Brings out inner talents. Lightheartedness, joy. Chakra: Heart. CITRINE: A variety of quartz. Good for kidneys, colon, liver, gallbladder, digestive organs, heart. Tissue regeneration. Detoxifies physical/emotional/mental bodies. Enhances body's healing energy. Diminishes self-destructive tendencies. Raises self-esteem. Powerful alignment with High Self. Lightheartedness, cheerfulness, hope. Warming, energizing. Attracts abundance. Chakras: Navel, Crown. COPPER: Influences flow of blood. Supplies strong energy to body/mind. Aids metabolism. Helps detoxify body. An aid for exhaustion and sexual imbalance. Aligns physical/emotional bodies. Raises self-esteem. Strong conductor of energy. DIAMOND: Enhances brain functions. Aids alignment of cranial bones. Breaks up blockages in crown chakra and in the personality. Master healer. Dispels negativity. Purifies physical/etheric bodies. Reflects will and power aspects of God. Enhances full spectrum of energies in body/mind/spirit. Alignment with High Self. Abundance, innocence, purity, faithfulness. Chakras: All. EMERALD: A variety of beryl. Strengthens heart, liver, kidneys, immune system, nervous system. Tonic for body/mind/spirit. Aids alignment of subtle bodies. Enhances dreams, meditation, deeper spiritual insight. Represents the potential of divinity within us. Prosperity, love, kindness, tranquility, balance, healing, patience. Strong emotional balancer. Chakras: Heart, Solar Plexus. FLUORITE: Strengthens teeth and bones. Improves absorption of vital nutrients. Beneficial for blood vessels and spleen. Grounds excess energy. Excellent for advancement of mind, greater concentration, meditation. Helps one grasp higher, more abstract concepts. Facilitates interdimensional communication. Powerful healer. Works with chakras and attitudes according to color of stone. kundalini. Stimulates pituitary gland. Aligns subtle bodies. Love, compassion. Enhances imagination. Chakras: Root, Heart. HEMATITE: Has positive effect upon bloodstream. Activates spleen. Increases resistance to stress. Helps circulate oxygen throughout the body. Strengthens physical and etheric bodies. Energizing, vitalizing. Enhances personal magnetism, optimism, will, courage. Slightly grounding. Powerful stone for those attracted to it. HERKIMER DIAMOND: A type of quartz crystal. Cleanses subtle bodies. Reduces stress. Balances and purifies energy within body and mind. Similar qualities as clear quartz. Powerful amplifier. Enhances inner vision. Increases awareness of dreams - "dream crystal." Stores thought forms and information. Chakras: All. HOWLITE: A simple and gentle stone. aids and deepens sleep. Helps one to access and bring back wisdom from the dream state. Calms and soothes the emotions; reducing anxiety, stress, tension. Assists in loosening/dispersing muscular tension. Excellent for bones and pregnant and nursing mothers(because of strong calcium content/vibration). Enhances brain and nervous system functions, contributes to positive emotional expression. Chakra(s): gently influences all chakras. JADE: Strengthens heart, kidneys, immune system. Helps cleanse blood. Increases longevity and fertility. Aids eye disorders and female problems. Power emotional balancer. Radiates divine, unconditional love. Clarity, modesty, courage, justice, wisdom. Peaceful and nurturing. Dispels negativity. Healing affinity will correspond to particular color of stone. 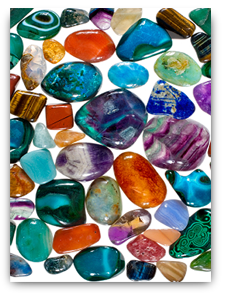 JASPER (All colors): A variety of chalcedony. Strengthens liver, gallbladder, bladder. Powerful healer; main impact on physical body. Represents earth element. Works with chakras and attitudes according to color. KYANITE: Strengthens throat chakra. Enhances creative expression, communication, truth, loyalty, reliability, serenity. Connection to casual plane. Facilitates astral/interdimensional travel. Chakras: Throat, Third Eye. LABRADORITE/SPECTROLITE: A mystical stone revealing shimmering iridescent colours. Has the ability to heal pone reactivate ancient/future memories that are relevant to one's present growth. Helps one transcend the sense of separateness; dissolving personal boundaries and aligning with the One/Divine source. Accelerates telepathic abilities. Assists communication with the Higher Self and spirit guides. Deepens meditation and helps one clear their connection and intuition, discernment, inspiration, imagination. Helps balance/stabilize the movement of the sexual/life-force (kundalini). Beneficially influences nerves, brain, pineal, and pituitary glands, bones, lymphatic system, liver. Chakra(s): crown, brow, heart, throat. chakras. Mental clarity, illumination. Enhances psychic abilities and communication with Higher Self and Spirit Guides. Creative expression. Chakras: Third Eye, Throat. LEPIDOLITE: Aids muscles, strengthens heart, beneficially influences blood. High lithium content aids emotional/mental balance and stability. Aids sleep. Enhances expression of one's inner light and joy. Chakra: Heart. MALACHITE: Aids functions of pancreas and spleen. Reduces stress and tension. Aids tissue regeneration. Strengthens heart, circulatory system, pineal and pituitaru glands. Aids sleep. Vitalizing for body/mind. Reveals subconscious blocks. Excellent balancer on all levels. Chakras: Heart, Solar Plexus. MOONSTONE: Has healing affinity with stomach, spleen, pancreas, pituitary gland. Unblocks lymphatic system. Relieves anxiety and stress. Aids birthing process, helps female problems. Emotional balancer; helps lessen tendency to over react emotionally. Flexibility in attitudes. Aligns emotions with High Self. Chakra: Heart. OBSIDIAN: Beneficially influences stomach and intestines. Connects mind and emotions. Slightly masculine energy. Grounds spiritual energy into physical plane. Absorbs and disperses negativity. Reduces stress. Helps clear subconscious blocks. Brings an understanding of silence and "the void." Detachment, but with wisdom and love. Powerful healer for those attuned with it. Chakra: Root. ONYX: A variety of chalcedony. Relieves stress. Balances male/female polarities. Strengthens bone marrow. Aids detachment. Enhances emotional balance and self control. Higher inspiration. Works with chakras and attitudes according to color of stone. with highest aspects of being. Chakras: Heart and others, depending on color. PERIDOT (Olivine): Balances glandular system. Aids tissue regeneration. Has beneficial influence on heart, pancreas, spleen, liver, adrenals. Purifies body. Enhances bloodstream. Overall balancer and tonic for body/mind. Aligns subtle bodies. Increases intuitive awareness. Reduces stress. Stimulates mind. Accelerates personal growth, opens new doors of opportunity. Chakras: Navel, Solar Plexus, Heart. PYRITE: Aids digestion, improves circulation. Strengthens and oxygenates blood. Enhances brain functions. Influences a more positive outlook on life. Enhances emotional body, strengthens will. Helps one's ability to work with others harmoniously. Practicality. Chakras: Root, Solar Plexus, Heart. interdimensional communication and communication with Higher Self and Spirit Guides. Chakras: All. ROSE QUARTZ: Aids kidneys and circulatory system. Increases fertility. Eases sexual/emotional imbalances. Helps clear stored anger, resentment, guilt, fear, jealousy. Reduces stress and tension, cools hot temper. Enhances self confidence and creativity. Aids development of forgiveness, compassion, love. "Love stone." Chakra: Heart. quartz. Pierces through layers of physical/emotional/mental density. Transmutes negativity. Enhances communication with Higher Self and Spirit Guides. Very powerful healer. Chakras: All. SAPPHIRE: Strengthens heart and kidneys. Activates pituitary gland, thereby aiding entire glandular system. Aligns body/mind/spirit. Stimulates psychic abilities, clarity and inspiration. Creative expression, loyalty, love. Aids connection with Higher Self/Spirit Guides. Strengthens will. Expands cosmic awareness. Dispels confusion. Excellent for meditation. Chakras: Throat, Third Eye. SELENITE (Gypsum): Strengthens bones, teeth. Soothes nerves. Has positive effect on brain, aiding power of concentration and clarity. Enhances willpower. Grounded white light. Chakra: Crown. SILVER: Enhances mental functions. Aids circulation. Strengthens blood, physically and etherically. Strengthens pineal and pituitary glands. Relieves stress. Relates to the moon, subconscious, female aspect. Emotional balance. Speech improvement. Excellent energy conductor. SMOKY QUARTZ: Strengthens adrenals, kidneys, pancreas. Increases fertility, balances sexual energy. Aids depression. Mildly sedative and relaxing. Initiates movement of kundalini. Dissipates subconscious blocks and negativity on all levels. Grounding, centering. Excellent for meditation. Enhances dream awareness and channeling abilities. Chakras: Root, Navel, Solar Plexus. SODALITE: Aids pancreas, balances endocrine system, strengthens metabolism and lymphatic system. Balances male/female polarities. Alleviates fear. Calms and clears the mind. Slightly sedative, grounding. Cuts through density and illusion, bringing clarity and truth. Enhances communication, creative expression. Similar qualities as lapis lazuli. Chakras: Throat, Third Eye. TIGER EYE: Variety of chalcedony (quartz). Beneficial for spleen, pancreas, digestive organs, colon. Emotional balancer. Enhances connection with personal power and will. Grounding, centering. Helps soften stubbornness. Enhances clear perception and insight. Slightly masculine energy. Chakras: Navel, Solar Plexus. TOURMALINE: (All colors) Aids balance of endocrine system. Aids sleep. Strengthens, vitalizes body/mind. Activates and enhances crystalline properties of body/mind. Aligns subtle bodies. Dispels fear and negative conditions. Strong protective influence. Concentration, inspiration. Enhances sensitivity and understanding. Powerful healer, highly electromagnetic. The various color will activate and align corresponding chakras. (Watermelon Tourmaline/red/green) Root, Heart chakras. (Blue Tourmaline/Indicolite) Throat, Third Eye chakras. (Red/Pink Tourmaline/Rubellite) Root, Heart chakras. TURQUOISE: Tones, strengthens entire body. Tissue regeneration. Aids circulation, lungs, respiratory system. Vitalizes blood, nervous system. Aligns chakras. Enhances meditation. Creative expression, peace of mind, emotional balance, communication, friendship, loyalty. Chakras: Throat. Love Crystals? Want to Learn More? Try One of Our Crystal Classes!